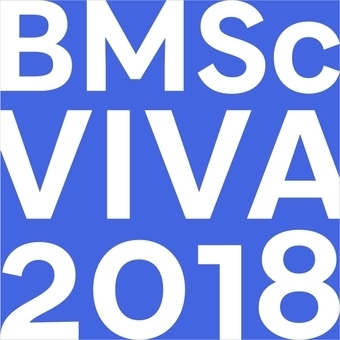 Thirteen Intercalated BMSc/BSc students studying Applied Orthopaedic Technology had their Viva examinations at the TORT Centre on Monday 21 May, 2018. Students gave a ten-minute oral presentation of their research findings prior to the Viva examinations which were conducted by a Board of Examiners comprised of Professor Rami Abboud (Internal Examiner/Convenor), Dr Tim Drew (Internal Examiner/Convenor), Mr Tim Clough (External Examiner - Consultant Orthopaedic Surgeon, Wrightington Hospital) and Mr Amit Putti (External Examiner - Consultant Orthopaedic Surgeon, NHS Forth Valley). Sadly this was the last time Mr Clough would be able to be External Examiner as he has now had 4 tenures. Professor Abboud presented Mr Clough with a framed print of Dundee over the Tay, a book about Scotland and a set of University of Dundee engraved glasses as a token of the Department’s appreciation for all his support of the Intercalated BMSc course over the years. By contrast this was Mr Putti’s first time as External Examiner. Mr Putti is in fact a graduate from the Department’s MCh (Orth) degree from 2004-2005 and is familiar with the dedication and hard work of the intercalated students. Left: Professor Rami Abboud presenting Mr Tim Clough with gifts of appreciation with Mr Amit Putti; Right: Relieved, relaxed and smiling intercalated students after completing their Viva examinations. Seumas Barker. Project Title: The use of heated and vibrating devices as part of a football warm-up: friend or foe? Supervisor: Professor Rami Abboud. Sarah Burns. Project Title: A comparison of the protection offered against lower leg injury by different types of football shin guards. Supervisor: Dr Tim Drew. Kirstie Farquhar. Project Title: Accuracy of two-dimensional and three-dimensional radiographic techniques in the diagnosis of unilateral condylar hyperplasia. Supervisors: Professor Grant McIntyre and Professor Peter Mossey (School of Dentistry). Frances Feeley. Project Title: Can foot angle influence the risk of injury to the lower limb joints during a field hockey hit? (presented at an International Conference, April 2018). Supervisor: Professor Rami Abboud. Peter Glenfield. Project Title: Effectiveness of the N-Pro head guard at reducing impact to the head of rugby union players. Supervisor: Dr Tim Drew. Catherine Hunter. Project Title: Stability of the knee joint during skiing: How does the moment arm of ground reaction force change with slope steepness and posture? (presented at an International Conference, April 2018). Supervisor: Professor Rami Abboud. Hamish Matthews. Project Title: Ergonomics of laparoscopic instruments affecting thenar eminence and 1st MCP joint. Supervisor: Miss Dorin Ziyaie, Dr Graham Arnold, Professor Rami Abboud. Emily McKenzie. Project Title: The effect of heel height on back pain in simulated pregnancy (presented at an International Conference, April 2018). Supervisor: Professor Rami Abboud. Patrick Porter. Project Title: Volar Plating: Functional recovery of the pronator quadratus. Supervisors: Mr Graeme Nicol and Dr Tim Drew. Michael Romano. Project Title: Analysis of the relationship between brain electronic activity when squatting and the implications on rehabilitation. Supervisor: Dr Weijie Wang. Calum Sreenan. Project Title: An investigation into the use of infrared technology to target and improve the recovery of athletes. Supervisor: Professor Rami Abboud. Jeremy Telford. Project Title: Mechanical testing of the Jaipur Foot against low, mid and high activity prosthetic feet used in the NHS. Supervisor: Dr Tim Drew. Alison Young. Project Title: Investigation into the importance of trekking poles in preventing injury when hillwalking (presented at an International Conference, April 2018). Supervisor: Professor Rami Abboud. Left to Right: Seumas Barker, Sarah Burns, Francess Feeley, Peter Glenfield, Catherine Hunter. Left to Right: Hamish Matthews, Emily McKenzie, Patrick Porter, Michael Romano, Calum Sreenan. Left: The board of examiners during students' Q&A sessions; Right: Jeremy Telford, Alison Young. “Another outstanding performance by our thirteen hard working intercalated students with many enduring the agony of going through the university research ethics approval process and with one in particular, Patrick Porter, negotiating the intricacies of the daunting NHS Research Ethics. He showed great resilience and perseverance in scaling every hurdle to finally gain the green light in February to recruit 27 patients with less than two months to complete his study … and may I say that he completed it with flying colours! Many thanks must also go to Susan Storrier who has been monumental in helping students with their ethical approvals yet again this year. Many students devised their own projects in an area of their personal interest and five students had the opportunity to present their research at the 16th Staffordshire International Conference on Clinical Biomechanics earlier in the year and they were simply superb making us proud on what we offer at TORT and the University of Dundee. It was simply a pleasure to have this group of students with us for the last nine months and we can proudly say that they are now part of the extended TORT family and our valued ambassadors and I would on behalf of the whole academic department wish them all the best for the future. I would like to take this opportunity to pay a special tribute to Mr Tim Clough for his past four years as our intercalated degree external examiner. He always brings a special touch of humour to what is an intense viva environment making the students feel at ease from the first minute and allowing them to perform to the best of their abilities during the viva. We will for sure miss him as an external examiner and his last words were “Don’t exclude me from the excellent research taking place in TORT, happy to help in any way I can”, in response, thanks Tim, I won’t. At the same time I would like to warmly welcome Mr Amit Putti, one of our valued alumni from 2005, as our new external examiner for the next four academic years, which I have no doubt will be of great value to the department and our future students. A final thanks for the whole dedicated team at TORT for making this year another successful year for our intercalated students and for allowing them to leave with fond memories. I am forever indebted to your work ethos, commitment and above all your loyalty to me and the department", added Professor Abboud.